As you complete accomplishments in the game, the villagers will reward you with large, gold trophies you can display in your house. The morning after you complete a task, one of the villagers will stop by and give you a trophy. Hanna gives you the Animal Trophy, Craig gives you the Crop Trophy, and so on. These trophies will take up just 1 square of floor space inside of your house. There isn't any advantage to having the trophy on display (your plants won't grow better if you have the Crop Trophy out), but they do look rather nice. There are 8 trophies you can collect for your house. You will find the awards in the "Other" category (the clock) when you are looking at your furniture menu. Seven of the trophies are based off of your items list. 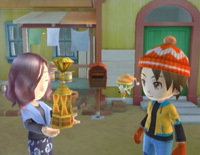 When you acquire every type of item on a list, you'll receive a trophy for it. You don't necessarily have to ship the item; you just have to have it at some point. You can view your items list by going to your bookcase and looking at your encyclopedia (the red book). You have to grow/acquire each one of the crops listed in the Crop Encyclopedia. Crops include vegetables, grains, and tree fruits. There are 32 listings to complete. The quality of crop does not matter. You will need to collect one of each of the flowers listed in the Flower Encyclopedia. There are a total of 18 flowers listed. To complete the Animal Encyclopedia you need to have 1 of each type listed on your farm at some point in time. The color of the animal does not matter (a black cow counts the same as a brown cow) but you need to have baby and adult farm animals for some of them. Silkworms are the only animals that don't have a juvenile form. The list also includes all of the wild animal pets that you can meet around Castanet, but it is not required that you have each one of them on your farm. You just have to meet the wild animal for it to be added to your Animal Encyclopedia. There are a total of 39 listings in the encyclopedia. The items in the Ranch Encyclopedia are products you can receive from your livestock and poultry animals. The quality of the item does not matter. There are 21 items to collect. Strangely enough, the Flax Yarn is a part of the Ranching Encyclopedia and not the Crop Encyclopedia, even though it's grown as a crop. Honey comes from the bees that randomly appear when you grow flowers in your crop field. You will have to catch all of the 47 different kinds of fish that live around Castanet. There are a lot of different places to catch fish, such as the waterfall in Garmoni Mine district or around Toucan Island. There are some places you would never think would have fish at all, like the pools of water that surround the Blue Bell in Watery Cave. Winning this trophy comes from filling up the Mining Encyclopedia with the ores and wonderfuls you can find in the three mines. This also includes the names of the metals and jewels that Mira processes for 35 G a piece. There are 37 items listed. Instead of relying on an encyclopedia, you can use your list of recipes as a guide. There are eight cooking categories; Knife Set, Pot, Frying Pan, Oven, Mixer, Aging Pot, Bonfire, and Ice Cream Maker. You have to complete all 235 cooking recipes before you're awarded the trophy for cooking from Yolanda. To learn recipes you can cook the dishes yourself, buy the recipes from the shops, or discover them by pressing A while looking through other villager's kitchens. As you are going through the Purple Bell part of the story, you'll come across a Wishing Shrine that you can tell the villager's wishes to. When you raise a villager to 3 hearts, he/she will tell you a wish they feel is important to them. Once you hear the wish, return to the church and tell the wall painting the person's wish. In order to proceed past the Purple Bell you will need to tell the shrine 10 wishes. You can still continue to collect wishes for the shrine after you have finished that part of the story line. If you collect wishes from every villager and tell them all to the painting in Perry's room, you will be rewarded with a trophy. The Harvest Goddess and Harvest King do not give you a wish. You'll will have to collect wishes from rival children that appear. For example, if you married Maya so Chase never does, Dakota won't appear in your game. Since she doens't appear, you don't have to collect a wish from her. You also have to collect wishes from your two children, but not from your spouse. You would of received your spouse's wish before you were married as you were raising your friendship with him/her. After you give the painting the last wish, you will be given the trophy. It will automatically be sent to your house.